This one is the prettiest type and the strongest kind of the full tang blade which is first to be made in this ladies kind. This khurmi is of many types. This one is the prettiest type and the strongest kind because of the full flat tang blade which is the first to be crafted on any Khurmi blade. 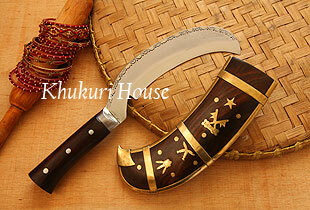 Its case and the handle is made of Indian rosewood. National symbols such as the King's crown, national bird and flower and the sign of brave gurkhas (two kukris crossed)can be seen on its case to represent Nepal.